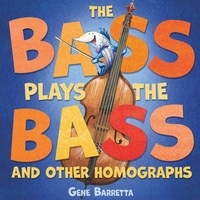 A picture book about homographs and wordplay starring a hilarious cast of animal musicians. The all-animal music festival Zoola Palooza has come to town. With a motley crew of animals playing a variety of instruments, homographs abound. Homographs are words that are spelled the same but sound different and have different meanings. Billy the striped BASS opens the show wearing a big BOW tie. He gives a gracious BOW from the top of his BASS fiddle. This terrific companion to Dear Deer: A Book of Homophones and The Bat Can Bat: A Book of True Homonyms brings homographs to the spotlight for a show-stopping good time.